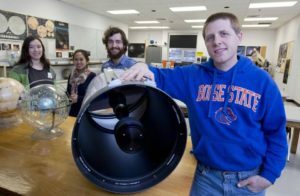 I am an assistant professor teaching astronomy in the Physics Department at Boise State University. Before coming to Boise State, I was a postdoctoral fellow at the Carnegie Institution of Washington’s Dept. of Terrestrial Magnetism in Washington DC and before that, at NASA’s Goddard Space Flight Center in Greenbelt MD. I earned my PhD in Planetary Science from the University of Arizona‘s Lunar and Planetary Laboratory in Tucson AZ and my BS in Physics from Georgia Tech in Atlanta GA.
My research focuses primarily on orbital dynamics and transit observations of extrasolar planets, planets outside of our solar system. I also do some planetary science field work, notably on Death Valley’s Racetrack Playa and on terrestrial and Martian dust devils. When I’m not chasing my daughter around the house, I enjoy running around Boise and learning classical guitar.